‘The Amiable Cassandra’ is a must-read for any Janeite yearning for an original story that poignantly resonates of Austen and her incomparable work. Using the Austen ‘formula’, this novel blends documented history, elements of Austen’s most beloved plots-lots, characters and themes alongside the parallel enigmatic history of ‘The Bath Novels of Lady A~’, to create an exceptionally thought-provoking Regency drama. Published purposely in advance of the bicentenary of Jane Austen’s passing in 1817, 'The Amiable Cassandra' celebrates her remarkable life as only she might have wittily imagined it—for herself—for her allies—and, notably, for her enemies. Regard what the ‘Beau Monde’ is saying about TBNLA! As a fan of the Bath Novels, this second book of the collection was just brilliant. Supposedly crafted by Jane Austen herself, it tells the story of Austen as 'Cassandra Ashton-Dennis', a celebrated (anonymous novelist) who becomes the heroine of her own love story while crafting the books we all know--and those we come to know as the 'Bath Novels'. The protagonists, Cassandra Ashton-Dennis and John Lascelles, are exceptional and the other diverse characters are very engaging; I particularly liked Cassandra's sister, Eliza, and her cousin, Charlotte de Lafayette.This is a highly entertaining must-read for summer. 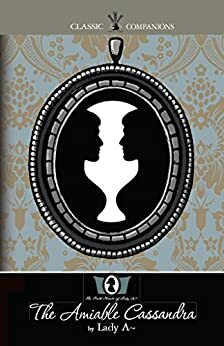 I’ve just started reading The Amiable Cassandra and I am hooked!!! I need some time off work to sit back and savour. Jane Austen fans… loving this. Jane’s life in fiction… wow. This novel is a stylish take on Austen, about Austen as the famous novelist, seemingly by Austen writing as 'Lady A~'. The character of 'Cassandra' is wrapped up in Austen's personal and professional history, and the author, whom readers might believe is in fact Jane, has created an intriguing story out of it all. It comes complete with a really impressive hero, John Lascelles, and many surprising twists in a complex romance that make the plot really engaging. I recommend this great read to Jane Austen fans and anyone who loves Regency dramas and romance.